During this information session, we will discuss the opening of the DGA Gaming Fieldlab. The DGA Gaming Fieldlab supports the Dutch game industry by accommodating research-industry collaborations. Fieldlab activities include networking, matchmaking and knowledge sharing between researchers and game professionals. The DGA Gaming Fieldlab also provides funds for joint research projects. To this end, it issues a call for research proposals particularly addressing advanced game technologies and associated methodologies that aim to bring game design and development to the next level. 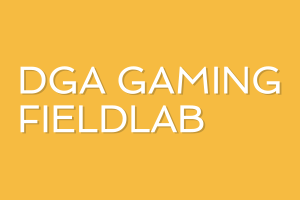 Learn more about the DGA Gaming Fieldlab on the website. The DGA Gaming Fieldlab information session will take place right before Dutch Game Summit 2019. Upon booking your tickets for this session, you will receive an e-mail that contains instructions to claim complementary tickets for Dutch Game Summit 2019. Find out more about this event and the program here. The event takes place at the Beatrixgebouw in Utrecht. More information on routing and parking can be found here. Address: Jaarbeursplein 6, 3521 AL Utrecht, The Netherlands.